There is something to be said about quicker versions of classic comfort foods. I love the appeal of some long roasting, braising, baking, simmering dishes, but sometimes I just don't have the time or patience for them. Lasagna is a prime example! Don't get me wrong, when I have the time and a napping (or settled) toddler, I love to immerse myself in making a lasagna. So much so that I usually make two - one to bake, one to freeze for later. That being said, rarely is Ty perfectly content to just chill with me while I'm assembling lasagna. I long for the days of being able to have a kitchen helper, but we're definitely not there yet. 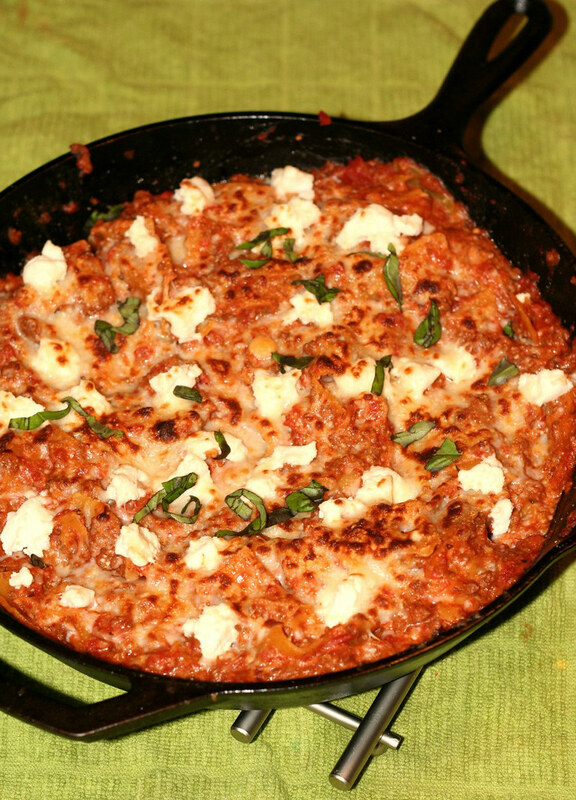 Then, I stumbled across this recipe for skillet lasagna on Pinterest, only to find out that it came from one of my favorite bloggers (Josie of Pink Parsley). I've heard of skillet lasagna before, and though the idea's always intrigued me, I've never really given more than 2 thoughts to it because the recipes never seemed like they'd actually taste like lasagna. If I'm going to make a skillet lasagna, it darn well better taste like lasagna or Rob would never forgive me. Well, Rob was happy with the outcome of this dish, so I'd call it a success. Me, I was more than happy with it. Not only did it honestly taste like lasagna, it was quick and easy enough to make on a weeknight. That's my kind of lasagna! ~1 cup of water, using the tomato puree can to get a little residual puree off the sides! Heat oil in a 12-inch nonstick skillet over medium heat. Add the onion, stirring often, until softened, about 5 minutes. Stir in the garlic and cook until fragrant, about 30 seconds. Add the ground sirloin to the skillet. Cook, stirring often and using a spoon to break up the meat, until no longer pink. Scatter the pasta in the skillet, then pour tomato sauce and puree over the top. Add a little extra water using the puree can. Add Italian Seasoning, Red Pepper Flakes, salt, pepper and wine. Stir, increase the heat to medium-high and cover. Cook at a vigorous simmer, stirring often, until the pasta is tender, about 20-25 minutes. Remove the skillet from heat, and stir in half of the mozzarella and Parmesan, and 1/4 cup of the ricotta. Dot the remaining ricotta over the noodles, then sprinkle with the remaining mozzarella and Parmesan. Transfer to the oven and broil until the cheese melts and is starting to brown. Remove from oven, sprinkle with basil and serve. 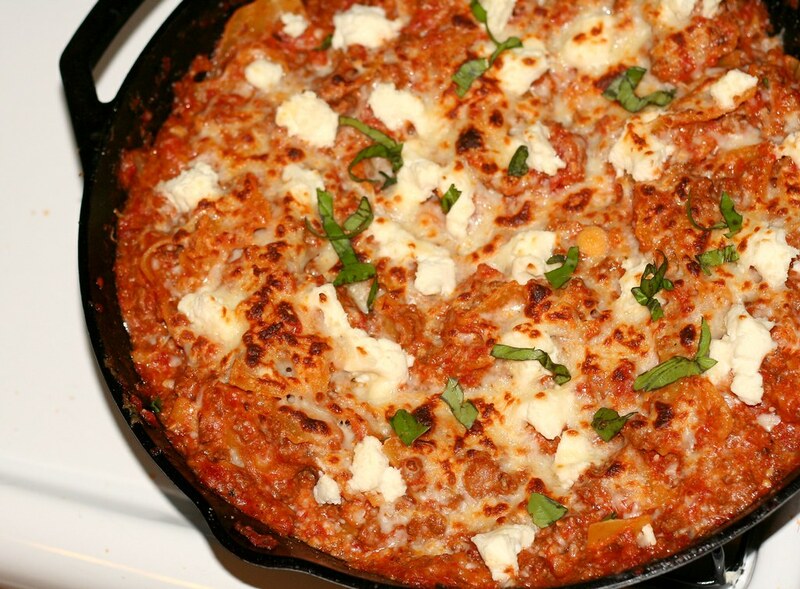 What a great idea to make lasagna in a skillet! I need to try this soon - thanks for the recipe! This sounds great. I've never made a skillet style lasagna... only the traditional way. Need to make this recipe soon! I love how skillet lasagna has all the taste of regular lasagna but is so much easier to prep! A great, quick meal with tons of flavor. This looks great!